Have you ever wondered where the smallest hotel in the world is? If yes, then you would be surprised to know that it is extremely narrow tenement that boasts a maximum occupancy of just two. It’s a cozy place, and sleeping in that hotel room simply means that you can outstretch your arms and almost touch both walls at once. 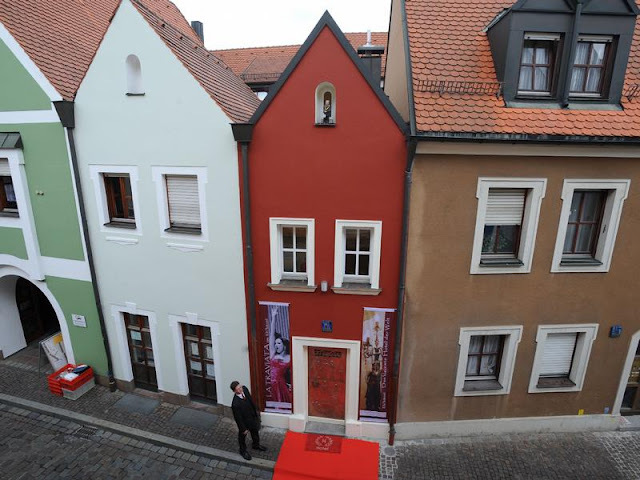 According to the Guinness World Record, The Eh’häusl Hotel in Amberg, Germany is the world’s smallest hotel. It has a total floorspace of just 53 square meters. The hotel is sandwiched between two larger buildings. However, it provides you a wonderful opportunity to experience the novelty of staying in the world’s smallest hotel. The hotel was built in 1728, and you will be amazed to know that the building used to an important and interesting purpose in the Bavarian town of Amberg. At that time, in order to get married a couple had to own property. However, it was not possible for every couple to purchase the conventional piece of property. Those couples could buy the Eh’häusl in order to appease the town council’s bylaw. Once they get married, the house could be sold to the next prospective couple. It’s narrow but at the same time, it’s tall enough for a variety of rooms, including a bedroom, bathroom, salon/sitting area and fireplace room. There is no space for staff, though. While staying in the Eh’häusl, there would not be anyone disturb the guests, and this is the reason why this place becomes even more romantic. It is believed that any couple who stays at the hotel will live a happy life together. So, if you want to spend a romantic holiday, you ought to definitely pay a visit to this hotel.